Vega’s P80 first stage is transferred from the zone where solid propellant stages are prepared at the Spaceport (photo at left) to the SLV launch zone (photos center, and at right). Scheduled for liftoff in December, Vega will orbit Turkey’s GÖKTÜRK-1A satellite. Preparations are now underway for Arianespace’s next flight with its lightweight Vega, set for December 5, with the launcher taking shape at the Spaceport and the mission’s GÖKTÜRK-1A payload for Turkey delivered to French Guiana. The launch vehicle build-up process began with Vega’s P80 first stage rollout from the zone where solid propellant stages are prepared at the Spaceport. Riding atop a heavy-duty transporter, the P80 was transferred to the SLV launch site, marking the first step in Vega’s assembly process. Vega’s P80 is one of the largest, most powerful one-piece solid-fuel stages ever built. Sized at just under 11 meters tall, this propulsion system has a 3-meter diameter and weighs in at approximately 95 tons. Vega’s Zefiro 23 second stage is moved into the Spaceport’s SLV launch zone, where it will be readied for mating with the vehicle’s P80 first stage. 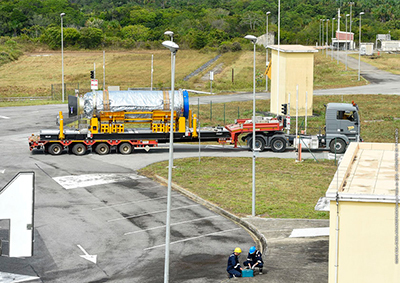 The four-stage Vega serves as the lightweight vehicle in Arianespace’s launcher family operated from French Guiana. Vega is a European Space Agency (ESA) program, jointly funded by Italy, France, Spain, Belgium, the Netherlands, Switzerland and Sweden. Avio is the launcher design authority and industrial prime contractor, operating through its Italian subsidiary ELV (in which the Italian space agency ASI has a 30 percent stake). Since beginning operation at the Spaceport in 2012, all of Vega’s previous seven flights have been successful, demonstrating the launcher’s capabilities in a variety of mission scenarios. 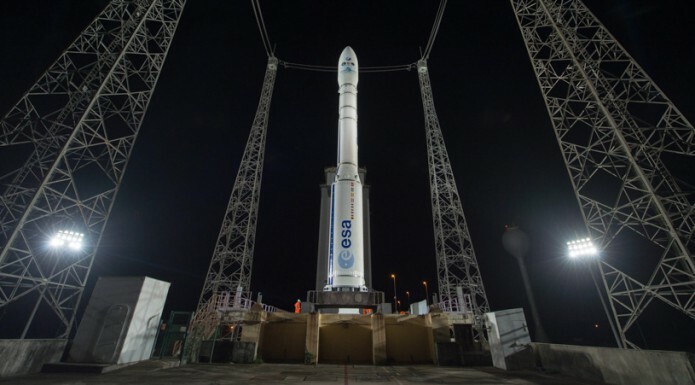 Vega’s payload on the December mission – designated VV08 in Arianespace’s launcher family numbering system – is the GÖKTÜRK-1A observation satellite, managed within the scope of a turnkey contract with Telespazio as prime contractor for the Undersecretariat for Defence Industries of Turkey. The protective container with GÖKTÜRK-1A is unloaded from an Antonov An-124 cargo jetliner after its arrival at Félix Eboué Airport in French Guiana. 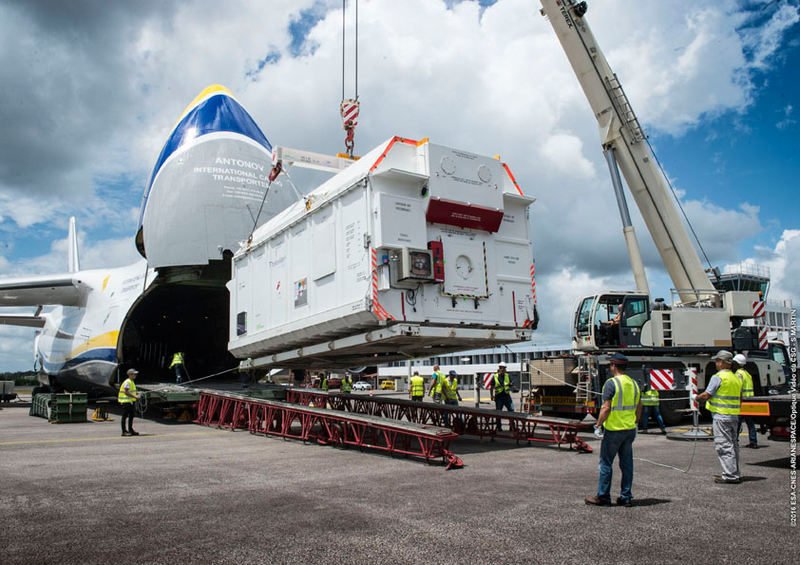 The spacecraft was delivered yesterday to French Guiana, arriving aboard a chartered Antonov An-124 cargo jetliner at Félix Eboué Airport near the French Guiana capital city of Cayenne. The protective container with GÖKTÜRK-1A was unloaded from the four-engine aircraft and readied for its transfer by road to the Spaceport. Equipped with a high resolution optical instrument, GÖKTÜRK-1A has an unfueled mass of approximately 1,070 kg. and will operate from Sun-synchronous orbit. Thales Alenia Space is responsible for the satellite, joined by Turkish partners that include Tai A.S., Aselsan A.S., Tubitak, Uekae, Roketsan A.S. and TR Tecnoloji.